You’re Dream Has Come True! You are the proud owner of your very own horse. Groom, train and care for your horse and become best friends forever! Best friends forever! Every one needs a best friend, and yours is your horse! Together, there’s nothing you can’t do. Practice hard to perfect your riding and jumping skills as you prepare for the all-important regional jumping competitions. Go for the blue ribbon! 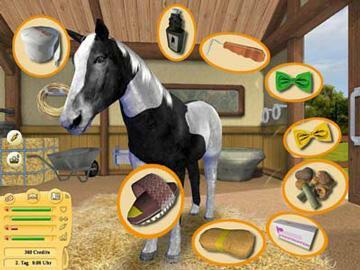 Select from 15 favorite horse breeds and hundreds of combinations of saddles, manes, tails, bridles and much more! Dress up your best friend from head to hoof! Choose from hundreds of coat, bridle, blanket and saddle combinations! Build a special relationship with your very own horse. Raising your friend from a foal, you will learn to keep your horse happy, healthy and clean. Give your new friend an extraordinary name, teach your horse to do tricks and even compete in World Championship riding events! So let’s get started! Let’s ride! 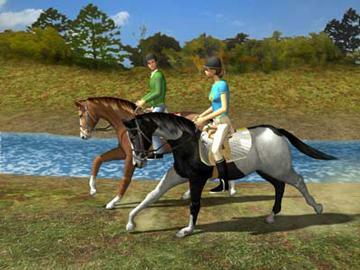 Build your friendship and bond with your horse on a relaxing ride through the fields. Win the trust of your horse through feeding, grooming and walking in the fields. Together, there’s nothing you can’t do! 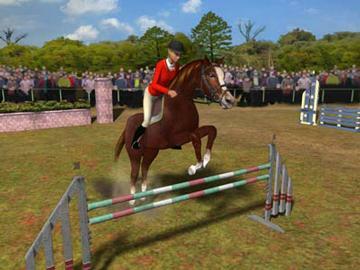 Enter your horse into the Jumping Tournaments and show ‘em that together you are the best! Create your own character with riding outfits, boots, hair color, hat and much more! Your Secrets are Safe! Only you and your best friend know what’s in your very own secret Let’s Ride diary.